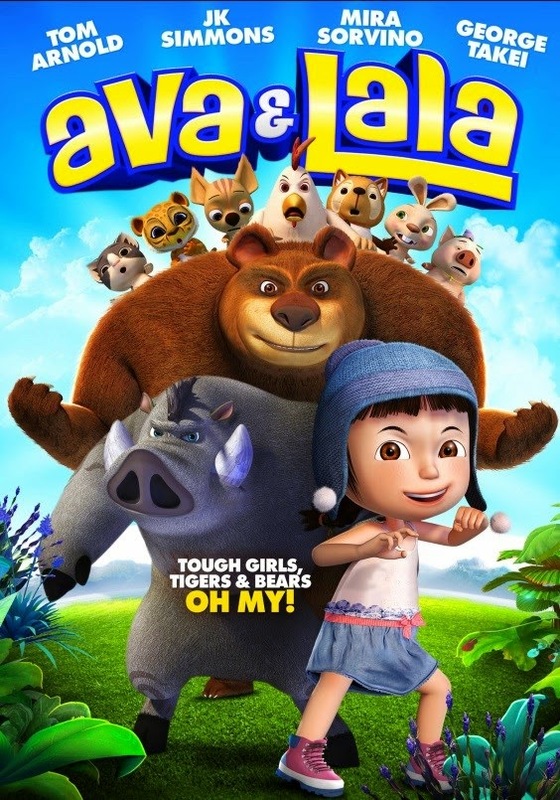 You know when I first heard about a new movie coming to DVD from Arc Entertainment called Ava and Lala, I was thinking it would possibly be a little girlie for the boys to enjoy. I had no idea what it was really about or how the boys would enjoy it. On October 7th, 2014, Arc Entertainment released Ava and Lala on DVD! The synopsis says "Ava is a mischievous young girl and martial arts student who really knows how to pack a punch! One day she meets Lala, a cuddly and kind tiger-like creature, and they discover they can talk to each other. She runs away from her village to join Lala in a mystical kingdom of wonderful animals, all specially chosen to live there, safe from humans. They befriend a huge bear who has a heart of gold, Uncle Bear, who tells them that Lala must leave the kingdom in three days, before the fierce Tiger General finds out they’re there. Uncle Bear is determined to help Ava escape, but they find out it’s not that easy, especially when the other animals discover that Lala has an extraordinary magical power. When Lala is captured, it’s up to Ava and Uncle Bear to rescue him in time to get Ava safely back home." I felt as if this was a drama in cartoon version. There was quite a bit going on and even a lot of action. The boys both watched it when it first arrived and said they thought it was good. However, they've only watched it once which is unusual for them. I just think even though the story line was very child like, there was too much going on possibly. Recommendation: I thought the story line was awesome as not only did it have the action to keep the boys interested but the overall lesson was a good one. Declan has even been reciting lines from the DVD over the last few days. Giveaway: Arc Entertainment is going to give one of A Lucky Ladybug's lucky readers a copy of Ava and Lala on DVD of their own! So far all's I can think of that I have been wanting is a set of kangaroo pouches for my purses in black. I already have the tan colored set. A monopoly board game is on my list so we can have more family games. I honestly have nothing on my list this year. I have on my list to purchase an abacus. This will be for my son who is on the autism spectrum to make math just a little bit easier for him. New clothes are on my Christmas list b/c i could really use some new ones! I haven't given much thought about Christmas lists, but I would love a new TV. I am still using a big boxy one. It would be nice to have a flat screen. I would like gift cards for new clothes. I lost a whole bunch of weight and I need a new wardrobe. My Christmas list includes a new spoon rest for my kitchen. One item on my list for my kids are LeapPad 3's. I would like a GoPro for my backpacking adventures. I have to second Gayle S. I cant even lift the tv my parents gave me.. im 29 and have never had a new tv. I would like a gift box from Hickory Farms. I would like a new laptop. I'd love a new printer. Mine bit the dust. I would like a kitchen aid mixer because of all of the baking that I do. It would make things a little easier. I would like a tablet computer for Christmas, I would use it to enter sweepstakes. A slow cooker would be a magnificent present! I am currently unemployed and would love a Kindle for my daughter. I would like to see more gift card giveaways. One item on my Christmas list is a new laptop. I want the VacuPractor. I have a bad back and they say that this has been helping people NOT have back surgery - that's my choice. A new camera, i dropped and broke mine so I can't take pictures anymore! On my wish list is a nail polish rack. I have so many polishes and am not organized !! One thing on my Christmas list is definitely gift cards. All my nieces and nephews are wanting gift cards this year instead of toys or electronics. We are planning on making a day out of shopping with each one. I would love an apple laptop. I'm so tired of dealing with windows. I just want my daughter and family to be happy and healthy. I just want to make Christmas traditions with my family, that would be the greatest gift to me! i want to get a new pair of pajamas for Christmas. i feel like i need a nice pair of pjs. Either a laptop or TV. My computer is ancient and need a back up and for the TV just have on in my room so would love one my living room. My main thing on my Christmas list for my little one this year, is a swingset lol. Not sure that's gonna happen yet, and for myself, that's either a sewing machine or a camera lens. An electrician is on my wish list, as I have lots of electrical issues in my house and would love someone to fix them! My list is short. I would like a puppy for my husband. He hasn't replaced the one dog that died several years ago! !